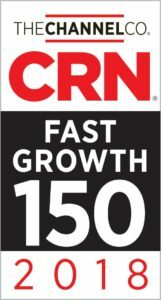 BUFFALO GROVE, IL – August 8, 2018 – CRN, a brand of the Channel Company, has named BCDVideo to its 2018 Fast Growth 150 list. The list is CRN’s annual ranking of the North America-based technology integrators, solution providers and IT consultants with gross sales of at least $1 million that have experienced significant economic growth over the last two years. The 2018 list is based on an increase of gross revenue between 2015 and 2017. The companies recognized this year represent a remarkable combine total revenue of more than $50 billion. “While it’s always nice to be recognized for doing something you’re passionate about, it is more a reflection on our customers who both believe in us and rely on our solution as part of their solution. That’s the real motivator,” commented Jeff Burgess, President and CEO of BCDVideo. The complete 2018 Fast Growth 150 list can be viewed online here.